Imagine running eight errands in a day: going to the post office, the drugstore, dropping off dry cleaning, going to the gas station, grocery store, and pet groomers, meeting a friend for lunch, and going to a movie. Now imagine having to return home in between each of those activities. When companies use a fork truck to go back and forth between the dock and the plant floor for assembly, it is an extraordinary waste of time. It is 100 percent antithetical to lean manufacturing principles. 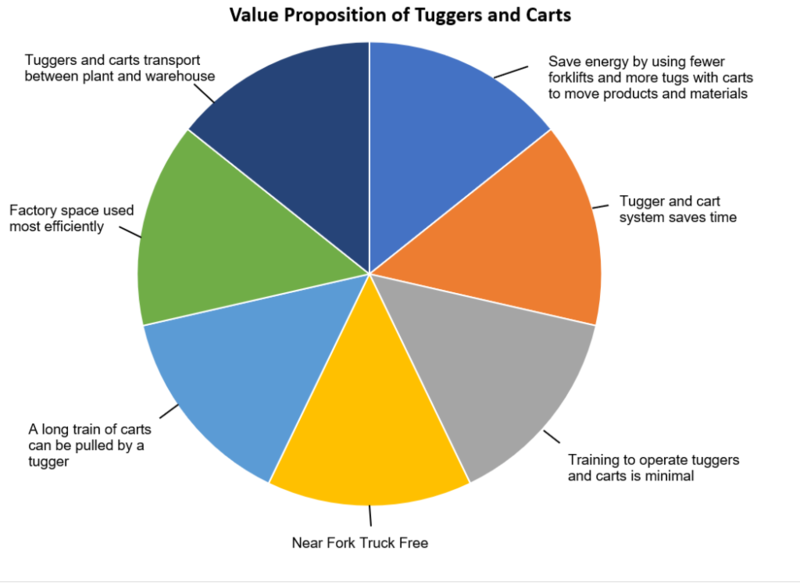 A tugger with eight carts can accomplish all the functions in one continuous trip; the need to double back to “home base” is totally eliminated. 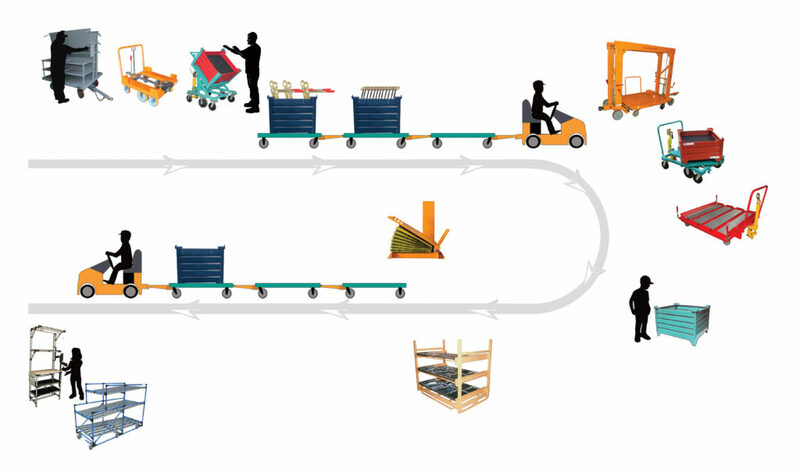 One driver pulling multiple carts to one destination is best-practice. It is a true process improvement. Each cart connected increases productivity, speeds line delivery rates, and reduces overall operator costs. The time saved moves manufacturers toward the fork truck free journey. 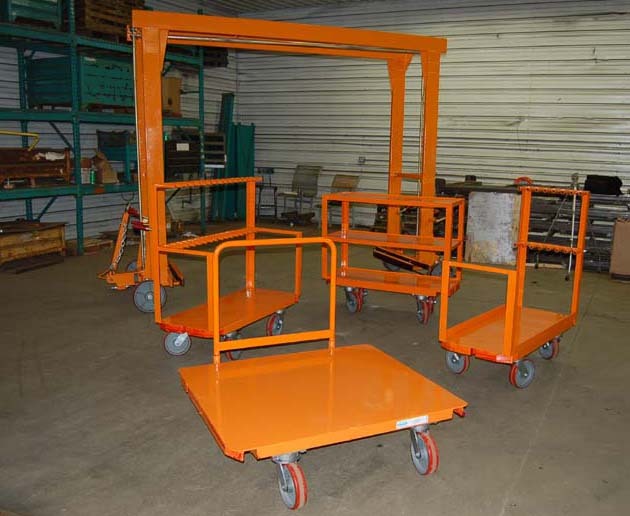 Topper Industrial is very proud of their patent pending Mother/Daughter Carts and Cart Systems. A Mother/Daughter Cart is an industrial cart system consisting of one large mother cart and two or more, smaller daughter carts. The daughter carts are designed to fit within the mother cart’s framework. Once inside, the daughter carts are locked into the mother cart. The mother cart and daughter carts are then able to be tugged as one. Daughter Carts are often different types of carts. For instance, One Mother Cart can be designed to carry a static cart as a daughter cart and a rotation cart as a daughter cart. The Mother/Daughter Cart System is a very flexible, effective cart system. Mother/Daughter Carts pulled by tuggers present materials or kits to the production line; then disconnecting the carts from the train. Fully loaded carts resupply the line; empty daughter carts previously delivered with materials are loaded back to the mother cart to be refilled. It is efficient, lean, and saves significant time. Production delays cost money and directly impact the bottom-line profitability. Kitting and staging are critical in the lean manufacturing process when processing parts, saving time, and eliminating production delays. Manufacturing assembly areas must be coordinated with flexible, custom-built, modular tubing defined by the specific task at-hand. Operations manage time and sequence components and parts needed for manufacturing a particular SKU. Creating kits of needed parts is supported by Mother/Daughter Carts that drop off the needed materials. This efficient assembly process ensures that stock levels are just-in-time, avoiding shortages and production delays. Topper usual starts with a kaizen event of the production process to determine the exact location of production delays. Labor waiting for parts is a disaster. Employees never waste time waiting by tugger delivered product. Topper Tube configurations make necessary parts available at the exact point needed on the production line. The reduction of time taken in processing parts and elimination of production delays can be quantified; typically a 50 percent improvement.